Inks include photo black, light black and light light black – plus cyan, light cyan, vivid magenta, vivid light magenta, yellow, orange, and green. Matte black is also included on-board and can be auto-switched with photo black. This page has some information about printers, collected before they were announced and actual product details. 21st There is a good thread at LL with some user experiences, and yes, we are still waiting to go to Epson UK to try one out for a more detailed report. 7th New firmware has been announced by Epson. It’s possible to update the firmware directly without manual downloading using the “Epson LFP Remote Panel 2” utility program). 5th We’re hearing of more deliveries in the UK and US now. 20th User guide and setup guide links added above. Deliveries in the UK are starting, and we are due to have an extended look at a 9900 in the next few weeks. 23rd Epson 78 page PDF presentation about the 7900/9900 available. Includes detailed info such as this chart showing ink drying colour stability. 2Dmax and L* values are based on Epson Premium Luster Photo Paper (260). With both Photo and Matte Black ink cartridges installed simultaneously, the Epson Stylus Pro 9900 HDR Ink printer automatically utilizes the optimal black ink mode, delivering maximum black density for the chosen media. Taking advantage of the Epson MicroPiezo TFP auto-sharing black ink channel ensures a fast and efficient switch. The standard 9900 HDR Photo Black ink mode can be used for any media type with professional results. However, for certain Epson media types such as Velvet Fine Art, Enhanced Matte, and UltraSmooth Fine Art, using the optional Matte Black ink mode will dramatically increase your black optical density resulting in a more dynamic looking print. Embedded sensors quickly verify nozzle status without using media and automatically clean the print head if required. “Epson seems to be gearing the x900-printers towards the proofing market. The sophisticated spectrometer is supposed to provide all kinds of fancy options like user-selectable black/white background, selectable UV-cut etc. The release mentions automatically scheduled recalibration options that only make sense in a rather industrial environment so expect this options to be somewhat expensive. Optional Spectrophotometer – Comes with both white and black backing plates and is available in both UV and UV cut versions (UV filter). The spectro has a built in fan to speed up the measuring process. Orange and Green inks – Expands the gamut (Orange is a useful addition for the R1900) possibly better thought of as a ‘dark yellow’. The new LUT technology from the R1900 and 2880gives a wider range of colours. This should reduce bronzing and improve visible dot pattern. The LCD display is now in colour. There is a new resolution mode of 1440×1440. The previous 1440×720 mode is now 720×1440. A new powered roll feeder means no more spindle. Two plug-in style carriers change from 2in to 3in core at the flick of a switch and there is no more normal and high tension settings – all automatic. A new printer mechanism, 11-colour UltraChrome HDR (High Dynamic Range) ink set plus a raft of new technologies extend Epson’s proofing capabilities into the packaging and flexographic markets. The Epson SpectroProofer option makes remote proofing a reality. 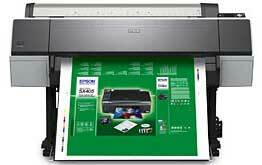 29 May 2008 – Epson is launching the 24″ Stylus Pro 7900 and 44″ Stylus Pro 9900, setting a new standard for the professional large format printer market. An improved ink formulation, a new printer mechanism and a raft of new technologies make these two new additions to the Epson Stylus Pro range ideal for production and contract proofing, as well as the highest quality fine-art and photographic applications. They will also enable printers to extend their business into the demanding packaging proofing and flexographic markets. In addition an optional calibration and verification system, the Epson SpectroProofer, means the Stylus Pro 7900 and the Stylus Pro 9900 can be a confidently used for remote proofing. The new printer mechanism implemented in the Stylus Pro 7900 and 9900 builds on Epson’s MicroPiezo TFP (Thin Film Piezo) print head, introduced with the launch of the Stylus Pro 11880 last year. It delivers perfectly spherical dots with high precision dot placement and can deliver resolutions up to 2880 dpi. Both the number of nozzles and throughput has been doubled in the Stylus Pro 7900 and 9900, resulting in a maximum speed of up to 40 square metres per hour. At these increased print speeds, the new 10-channel MicroPiezo TFP print head ensures production of the highest image quality. The Epson Stylus Pro 7900 and Stylus Pro 9900 utilize a new 5th generation pigment ink, which is key to the quality of print output. 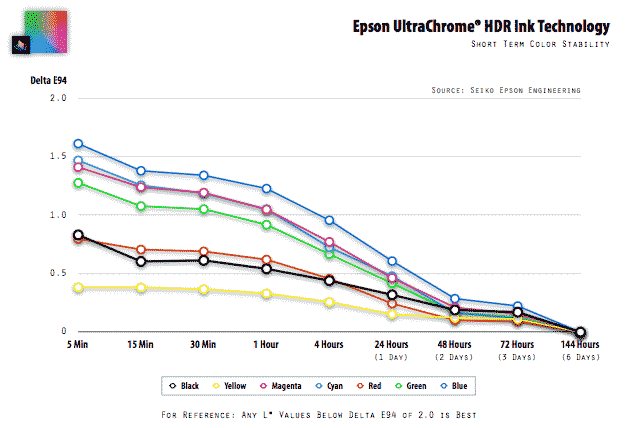 Epson UltraChrome HDR (High Dynamic Range) ink is an 11-colour ink set consisting of Pk, Mk, Lk, LLK, C, VM, Y, Lc, VLm, Or and Gr available in 350ml and 700ml cartridges. This high quality ink set expands on Epson’s UltraChrome K3 with Vivid Magenta by adding Orange and Green inks, which significantly increases the range of colours that can be achieved, especially bright green to yellow, and yellow to red. The Orange ink in particular contributes to reducing the graininess in skin tone. Epson UltraChrome HDR pushes the limits of ink chemistry to deliver the widest colour gamut on the market to date on a variety of media. This makes the Stylus Pro 7900 and 9900 ideal solutions to address the high demand for colour representation in proof production, especially when there is a particular requirement for spot colours. The new ink technology’s ability to both maximize the colour gamut without sacrificing print quality and deliver smoother gradation is optimized by Epson’s new LUT technology. Through advanced mathematical translation of RGB into 11-colour CMYK, the LUT technology seamlessly integrates hi-fidelity primaries allowing colour constancy under different light conditions, smoother transitions between colours, grain reduction and gamut smoothing. The optional Epson SpectroProofer tool turns the Epson Stylus Pro 7900 and Stylus Pro 9900 into a reliable, consistent and repeatable proof verification and printer calibration solution, making remote proofing a reality. By using this spectrophotometer solution, the following colour control workflows can be achieved automatically and very precisely: colour calibration, colour certification, a daily colour check, profile creation, spot colour matching, colour shift tracking and target measurement. Furthermore, a colour certification label, like the Fogra wedge, can be printed to support the certification process. The Epson SpectroProofer in-line, off-carriage calibration and verification system is powered by an X-Rite spectrophotometer and controlled by Epson SpectroProofer software or a third party RIP. It is available with or without a UV-cut filter as well as changeable black or white backing. Other new technologies featured in the Stylus Pro 7900 and 9900 include the ability to automatically switch between Photo and Matte Black inks; an integral automatic media rotary knife cutting system; a new spindleless roll holder mechanism; a new automatic paper set/release mechanism and Epson’s new automatic nozzle check technology. In addition, the launch of the two new printers also sees the launch of a new line up of high performance fine art media, as well as backlit media. The Epson Stylus Pro 7900 (24 inch – pictured right) and Stylus Pro 9900 (44 inch) are Epson’s first ten colour printers equipped with a revolutionary new pigment ink technology – Epson UltraChrome HDR (High Dynamic Range) ink. This ink set incorporates orange and green to considerably expand the colour gamut and increase digital printing opportunities within the package and remote proofing market segments. An Epson business solutions manager, Craig Heckenberg, (pictured) believes that both the Stylus Pro 7900 and Stylus Pro 9900 are breakthrough technology that will be well received in the Australian market. “The Epson Stylus Pro 7900 and the Epson Stylus Pro 9900 machines will set even higher benchmarks for photographic image quality and colour accuracy,” he said. From the DRUPA show comes some news of the 9900 having that Spectrophotometer we first expected last year. X-Rite, Incorporated (XRIT), the world leader in colour management, measurement and communication technologies, and Epson, a global leader in imaging products, today announced that they have joined forces to develop the SpectroProofer, an in-line, off-carriage calibration and verification system for Epson’s newly launched Epson Stylus Pro 7900 and Stylus Pro 9900 large format printers. The new SpectroProofer will be showcased for the first time at Drupa 2008 on the Epson stand (Hall 5, Stand A01). Powered by X-Rite’s In-Line Spectrophotometer (ILS), the Epson SpectroProofer tool turns the Epson Stylus Pro 7900 and Stylus Pro 9900 into reliable, consistent and repeatable proof verification and printer calibration solutions. The embedded Epson SpectroProofer brings fully automated in-line proofing capabilities to the Epson Stylus Pro range to make remote proofing a reality. By enabling a high level of transparent automation, it significantly reduces workload, operation costs and increases workflow efficiency. “The new Epson Stylus Pro range with the SpectroProofer calibration and verification system will enable commercial printers to broaden their business by entering new market sectors, such as the packaging proofing and flexographic markets. This winning technology combination will also address the remote proofing needs of production proofing companies by giving them a much needed in-line automated remote proofing solution for their large format printers,” comments Marco van Niekerk, senior product manager, large format printers at Epson Europe. With the Epson SpectroProofer, the following colour control workflows can be achieved automatically and very precisely: colour calibration, colour certification, daily colour checks, profile creation, spot colour matching, colour shift tracking and target measurement. Furthermore, a colour certification label, like the Fogra wedge, can be printed to support the ISO certification process. The SpectroProofer allows initiation of a printer colour calibration test either automatically, at a predefined interval, or at the request of a service technician. A compact, carriage-mounted in-line spectrophotometer, with completely self-contained optics and electronics, X-Rite’s ILS platform enables seamless non-contact measurements for fast moving media and provides direct feedback for colour calibration/management and control of Epson Stylus Pro colour printers. It quickly sends the calculated colour data to a host RIP such as the Epson SpectroProofer software, via a direct USB interface link, providing on-the-fly calibration and closed loop, accurate colour management of the print process and patented remote control capabilities. The newly launched Epson 24″ Stylus Pro 7900 and 44″ Stylus Pro 9900 set new standards for the professional large format printer market. Improved ink formulation, a new printer mechanism and a raft of new technologies make these two new additions to the Epson Stylus Pro range ideal for production and contract proofing, as well as for the highest quality fine-art and photographic applications. They will also enable printers to extend their business into the demanding packaging proofing and flexographic markets. 15th Before the 11880 was announced, we had several comments suggesting it would have a built in spectrophotometer for calibration and profiling. It didn’t, and we’ve since had suggestions that the feature was being tested, and may well make an appearance in the 9880. 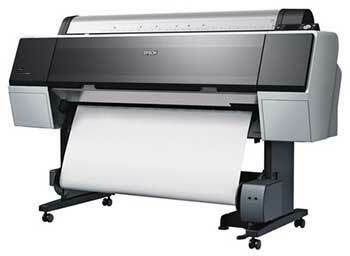 Several people have now suggested to us that Epson are looking to match various HP and Canon large format printers. Looks as if the new printers might show some genuinely new features rather than some of the (useful but) evolutionary changes over the last few years. 1st I’m told that the new printers should be thought of as an entire new range rather than an update or replacement for the 7880/9880. This suggests that we may see quite a few new features when they do finally appear. There’s further comment on this in a LL post suggesting that while the printers may be announced at DRUPA, it will be some time until they hit the market. Also, don’t expect a 3900 or 4900 for some time. Some people have asked about the 10 inks and what they’d be. If you have a look at the 11880 printhead (right) then you can see the 9 lines of nozzles. If you look at the GS6000 you can see it has Epson’s newly developed UltraChrome GS eight-colour ink set, comprising cyan, magenta, yellow, black, light cyan, light magenta, orange and green. The 9880 has 8 inks photo black/matte black, light black, light light black, cyan, light cyan, yellow, vivid magenta and vivid light magenta. Add full time MK/PK and you still get 9. Will we see a gloss optimiser (Glop)? A $3000 rebate scheme has also been announced for the 11880 – a 10 colour 11900 later this year? These will be 10 colour printers with expanded colour gamut. 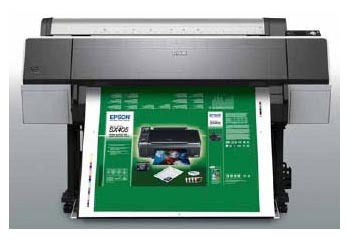 If the usual Epson nomenclature is followed then they will be 44″ and 24″ wide models. The Epson Stylus Pro 4880, 7880 and 9880 feature Epson’s breakthrough pigment ink technology, UltraChrome K3 ink with Vivid Magenta and improved image processing. They provide an enhanced colour gamut and superior tonal gradation, ideal for the professional in the proofing, photography, fine art and graphics markets. 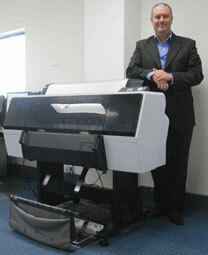 17 July 2007 – Epson launches three new large format, eight-colour professional production printers. They are the 17″ (A2+) Epson Stylus Pro 4880, 24″ (A1+) Stylus Pro 7880 and 44″ (B0+) Stylus Pro 9880. Each features Epson UltraChrome K3 ink with Vivid Magenta technology, the latest development in pigment chemistry, which offers a wide colour gamut and unrivalled image quality from an 8-colour inkset. The Epson large format printer range offers superior media flexibility and is compatible with a wide range of Epson paper up to 1.5mm in thickness. Glossy paper, matte paper, matte board, fine art paper and plain paper are all supported. The Epson Stylus Pro 4880, 7880 and Stylus Pro 9880 include a roll holder and cut sheet support, as standard. The Epson Stylus Pro 4880 also features a paper cassette feed mechanism for high-volume production on cut sheet paper from A4 (Letter) to 17″ (A2+) wide. Also new is an enhanced cutting sequence delivering a faster and more productive printing workflow. The UltraChrome K3 ink with Vivid Magenta, enables superb grey balance and precise colour without any colour cast. It also maintains the superior features of the UltraChrome K3 ink such as great colour accuracy of neutral and dark colours, excellent short-term colour stability and smooth tonal gradation from shadow to light. The issue of metamerism is virtually eliminated with this new inkset. The permanent Epson Micro Piezo printhead also offers unrivalled consistency in each print. Every print will be the same as the first, even if the artwork is printed months apart, making it ideal for studios producing limited edition print runs. 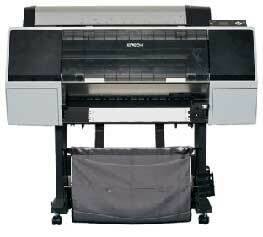 May 10, 2005 – Epson announced the launch of a new range of Stylus Pro large format printers to support the most advanced ink technology for colour and black & white photography and digital colour proofing. Comprising of three printers – the Epson Stylus Pro 4800, 7800, and 9800 – the range offers the ultimate in image quality, productivity, and media flexibility. The new range features a number of options to meet the varied demands of professionals in the imaging business. These include the ability to print any size ranging from maximum formats of A2 to A0+ on a wide range of media including high quality photo, art and proofing media. Featuring Epson’s core technologies, the range delivers outstanding results for print jobs where quality cannot be compromised. 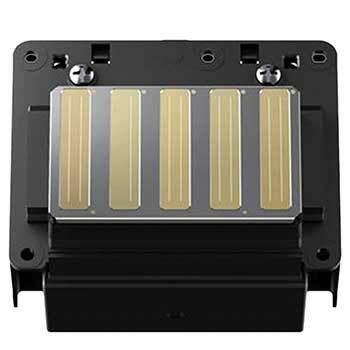 These include Epson’s ground breaking Micro Piezo print head technology, which precisely controls the amount of ink delivered, resulting in finely detailed images. The range also incorporates Epson’s Variable-sized Droplet Technology, which automatically adjusts the size of the droplet according to the image content. The range features Epson’s latest 8-colour ink technology – Epson UltraChrome K3 – which surpasses silver halide printing, thereby delivering the ultimate in colour and black & white photographic printing. The ink technology also delivers high quality, highly consistent digital colour proofing. Unlike other ink, the Epson UltraChrome K3 range has three black inks, as well as a full set of colour inks, offering the ultimate in black & white and colour printing. The three black inks offer more neutral gradations in colour and black & white prints, resulting in life-like replication of skin tones required for professional photographers. The third black ink – light light black – gives excellent greyscale performance and smoother tonal reproduction for the ultimate in high quality black & white and colour printing. The new ink set boasts many features to make it the ink of choice for those unwilling to compromise on quality. Featuring 8 ink cartridges, the UltraChrome K3 ink produces a wide colour gamut for accurate reproduction of saturated colours and accurate simulation of industry proofing standards. Furthermore, it delivers prints that look good in any lighting condition and have a professional finish even when printed on glossy media. The UltraChrome K3 ink is lightfast for up to 75 years for colour prints and over 100 years* for black & white prints, making it the ideal choice for artists producing work for use in exhibitions or those who need to reassure their customers the artwork will look good for longer.